Leopard Print Swing Dress is rated 4.8 out of 5 by 13. Adorned in a jersey material, this easy-to-wear leopard print swing dress is a must-have for every woman's wardrobe. 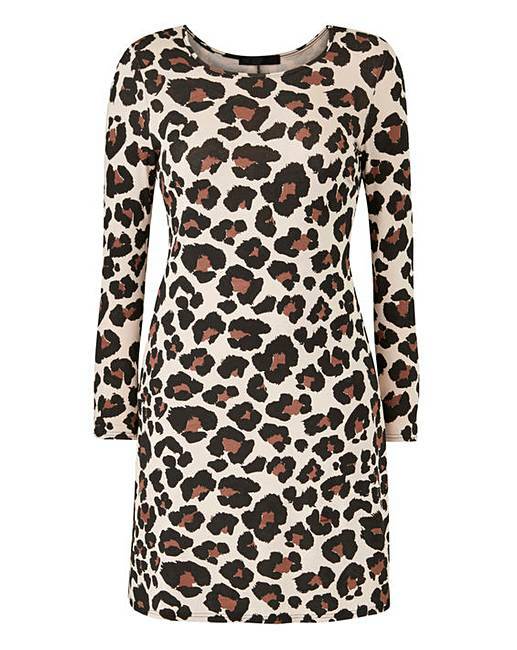 Available in an all-over stylish leopard print, this super-cute dress features a round neck and long sleeves and ensures you remain completely on trend this season. Rated 5 out of 5 by Kippo from Perfect Fit! I don’t normally wear dresses but this is so cumfy and flattering I bought another identical one! Rated 5 out of 5 by Leopard print dress from Lovely dress Bought this dress its perfect im every way,like it was made for me hangs lovely . Rated 5 out of 5 by Leigh77 from Love this dress!! Bought this dress last month and it’s so versatile!! Nice soft fabric and the leopard print is bang on trend. The fit is great too and sits well on all the right places. This can be worn dresses up with knee high boots and bare legs or with tights and Chelsea boots for an every day look. Definitely a wardrobe staple for the colder months. Rated 5 out of 5 by Mand5 from Lovely dress Brought for my daughter for Christmas, lovely dress . Rated 5 out of 5 by mumzy from Comfy and flattering Comfy, flattering and on trend. Versatile swing dress can be worn day or dressed up for night out.